Adults and children older than age 10: Initially, 10 to 15 mg/kg/day P.O. or I.V. (valproate sodium). May increase by 5 to 10 mg/kg/day q week until blood drug level is 50 to 100 mcg/ml or adverse reactions occur; don't exceed 60 mg/kg/day. If daily dosage exceeds 250 mg, give in two divided doses. Adults and children older than age 10: Initially, 15 mg/kg/day P.O. or I.V. (valproate sodium). May increase by 5 to 10 mg/kg/day at weekly intervals until therapeutic blood drug level is reached or adverse reactions occur; don't exceed 60 mg/kg/day. If daily dosage exceeds 250 mg, give in two divided doses. Adults: Initially, 750 mg (divalproex or valproic acid delayed-release) P.O. daily in divided doses. Titrate rapidly to desired effect or trough level of 50 to 125 mcg/ml. Don't exceed 60 mg/kg/day. Adults: 250 mg (divalproex or valproic acid delayed-release) P.O. b.i.d. Or 500 mg (divalproex extended-release) P.O. daily for 1 week (up to 1 g/day). Maximum dosage is 1 g/day. • Give I.V. only when oral therapy isn't feasible. • For I.V. use, dilute valproate sodium in at least 50 ml of dextrose 5% in water, lactated Ringer's solution, or normal saline solution. 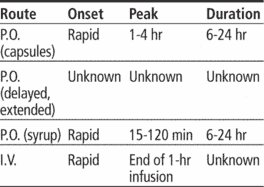 Infuse over 1 hour at a rate slower than 20 mg/minute. • Know that I.V. and P.O. dosages and dosing frequencies are identical. However, patient should be switched to oral therapy as soon as possible. • Give oral forms with food. • Be aware that divalproex extended-release and delayed-release forms are not bioequivalent. • Make sure patient swallows divalproex extended-release tablets and valproic acid capsules whole without chewing or crushing. • If patient can't swallow capsule containing coated particles, sprinkle entire contents of capsule onto about 5 ml of semisolid food, such as pudding or applesauce, immediately before giving. • Don't give syrup in carbonated beverages (may cause mouth and throat irritation). Closely monitor neurologic status. Watch for seizures and suicidal behavior or ideation. If hyperammonemia or hyperammonemic encephalopathy (unexplained lethargy and vomiting or changes in mental status) is suspected, measure ammonia level. Evaluate GI status. Stay alert for signs and symptoms of pancreatitis. Consider discontinuing drug if pancreatitis is diagnosed. Watch for diverse signs and symptoms of multiorgan hypersensitivity reaction, such as fever and rash associated with other organ system involvement (lymphadenopathy, hepatitis, liver function test abnormalities, hematologic abnormalities, pruritus, nephritis, oliguria, hepatorenal syndrome, arthralgia, and asthenia). Discontinue drug if multiorgan hypersensitivity reaction occurs. • Monitor I.V. infusion site for local reactions. • Assess CBC (including platelet count), prothrombin time, International Normalized Ratio, and liver function tests. • Monitor valproate blood level; therapeutic range is 50 to 100 mcg/ml. • Instruct patient to take with food to minimize GI upset. • Tell patient taking extended-release tablets or valproic acid capsules to swallow them whole without chewing or breaking. • Inform patient taking capsules with delayed-release pellets that he may swallow them whole or open them and sprinkle contents onto a teaspoon of semisolid food, such as pudding or applesauce. • Tell patient (or parents) that valproate syrup shouldn't be taken with carbonated beverages. Advise patient to immediately report signs and symptoms of liver dysfunction (such as malaise, weakness, lethargy, appetite loss, vomiting, or yellowing of skin or eyes), signs and symptoms of pancreatitis (such as abdominal pain, nausea, vomiting, loss of appetite), or suicidal behavior or ideation. Tell patient to immediately report unexplained signs and symptoms that may reflect hypersensitivity reaction (fever, rash, hepatitis signs and symptoms, bleeding or bruising, itching, urinary problems, muscle pains, or weakness). • If patient is taking drug for seizure control, tell him to avoid driving and other hazardous activities. Caution patient not to stop therapy abruptly. • Instruct patient to avoid alcohol. • Stress importance of follow-up laboratory tests. A trademark for valproic acid. a trademark for an anticonvulsant drug (divalproex sodium). Since its launch in 1975, Depakene has been widely prescribed to treat epilepsy, and in 2002, an indication was added for the treatment of the manic states of manic disorder and bipolar disorder. D) Depakote may sometimes be given at less frequent intervals than Depakene. A black box warning about the possibility of life-threatening pancreatitis has been added to the labels of Depakote, Depakene, and Depacon. 7% across the industry, sales continued to be robust, due to higher volume sales of core products including Coniel, a treatment for hypertension and angina pectoris, and Depakene, an anti-epileptic agent, and additional indications for Navelbine, an anti-cancer drug resulting in improved sales. Sales of Coniel, a treatment for hypertension and angina pectoris, and Depakene, an antiepileptic agent, were maintained at similar levels to those recorded in the previous fiscal year. Sales of Coniel, a treatment for hypertension and angina pectoris, and Depakene, an antiepileptic agent, were maintained at levels similar to those achieved in the first nine months of last fiscal year. Sales of Coniel, a treatment for hypertension and angina pectoris, and Depakene, an antiepileptic agent were similar to levels achieved in the interim period of last fiscal year. Net sales grew for Allelock, an antiallergic agent, Durotep Patch, an analgesic for persistent cancer pain and Depakene an antiepileptic agent. However, sales of Allelock, an antiallergic agent, Durotep Patch, a transdermal analgesic agent, and Depakene, an antiepileptic agent, all rose. The drug, Valproic Acid Syrup USP, is the generic equivalent of Abbott Labs' Depakene Syrup, a national brand with annual sales in excess of $8 million.